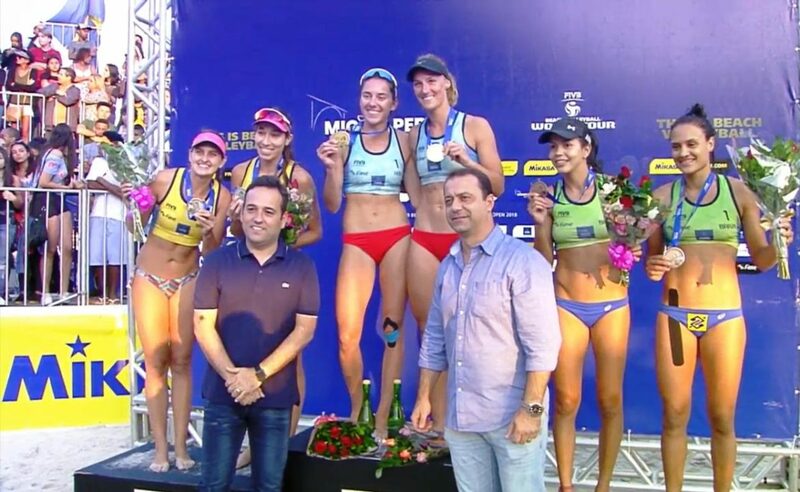 Romania’s Adriana-Maria Matei/Beata Vaida, the lone non-Brazilian team among eight semifinal teams on the men’s and women’s sides at the Miguel Pereira One Star, spoiled the home country’s efforts at a podium sweep, winning the women’s gold on Sunday. It was an historic medal for the 20-year-olds as it marked the first ever gold for Romania in World Tour history, either men’s or women’s. Fifth-seeded Matei/Vaida had to get through two Brazilian teams to claim the title. First the pair defeated No. 14 seed Naiana Rodrigues de Araujo/Rachel Nunes 21-9, 21-17 in just 30 minutes in the semifinals. The duo then downed No. 13 seed Aline Lebioda/Diana Bellas Romariz Silva 21-13, 21-19 in the gold medal match. In the championship, after a dominating first set, the Romanians rallied from down 17-14 with a 7-3 run to win on their first match-point try. The win not only gave Matei/Vaida the gold, but also avenged a three-set loss to Aline/Diana in pool play. Aline/Diana topped countrywomen Taina Silva Bigi/Victoria Lopes Pereira Tosta in tiebreak (21-16, 15-21, 15-11) to reach the final. Top seeded Taiana/Victoria sewed up the bronze with a 21-18, 21-19 win over Naiana/Rachel. The podium finishes were the first for all three medalists. Matei/Vaida bested their previous top finish, a fifth-place effort at the Aalsmeer One Star in October. The other three teams in the semifinals were making their FIVB World Tour debuts as pairs. On the men’s side, a Brazilian sweep was a surety as all four semifinalists hailed from the host country. The most unlikely team, however, came out on top as qualifiers Vinicius Rezende Costa Freitas/Luciano Ferreira de Paula wound up atop the podium in just their second FIVB tournament, following a 49th place effort at the Huntington Beach Open on May 6. Vinicius/Luciano fought to two tie-break wins on Sunday to earn the gold, rallying from a Set 1 loss in both contests. First up, the pair bested No. 6 Ramon Ferreira Gomes/Alvaro Marcelino Santos Andrade 15-21, 21-18, 15-11 in the semifinals. In the title match, the pair topped No. 10 Rodrigo Vieira Bernat/Harley Marques Silva 22-24, 21-18, 15-6. Bernat/Harley, who began the tournament as a wild card entry into the main draw, made the final, edging Felipe Cavazin Numasawa/Vinicius Gomes Cardoso de Araujo in a pair of deuce sets (24-22, 21-19). The silver medal is the 35th career FIVB medal for the 43-year old Harley, but the first for his 30-year partner. Ramon Gomes/Alvaro rounded out the podium with the bronze, defeating Numasawa/Vinicius 21-14, 21-14, for their first ever World Tour medal.